It has been argued that since Baptist churches use Protestant hymns, it is acceptable to use contemporary worship songs that are have a biblically-sound message. Another pastor said that if my position against CCM is true, I should stop using the King James Bible because it was written by Anglicans. If we buy into this popular argument, we will not be able to resist the onslaught of CCM in any effective manner except perhaps to stand against hard rock, and that stand won’t last very long. Those who accept soft rock will eventually accept “hard” rock. Both have the same sensual character. First, the old Protestant denominations were fundamentally different from their modern counterparts. The old Lutherans and Methodists were militant for the Christian faith and were not infiltrated by theological modernism, Darwinian evolution, and other new thinking. Unlike modern Protestants and “evangelicals” and the Contemporary Christian Music crowd, the old Protestants separated from the Roman Catholic Church. They hated popery. They were spiritual warriors, militant for what they believed. Consider, for example, the translators of the King James Bible. One of Francis Dillingham’s books was A Dissuasive against Popery. Lawrence Chaderton gave up his inheritance in order to convert to Protestantism against the will of his wealthy Catholic father. John Rainolds was one of England’s greatest champions for Protestantism. He publicly refuted Catholic giants such as Cardinal Bellarmine of Rome. In fact, the old Protestants were closer, spiritually and doctrinally, to the position of today’s old-fashioned Baptist church than to that of the contemporary movement. Second, CCM represents an end-time movement that is diametrically opposed to and is an avowed enemy of every “old-fashioned,” Bible-believing church and family. Contemporary worship music has transformational power that no Protestant hymn has. There is a transformational power in contemporary worship that can and eventually always will change the character of a Bible-believing separatist church. I’ve never heard of a youth group becoming Anglican by using the King James Bible, but show me a youth group that is messing with contemporary music, and I will show you one that is on a fast track to the world and to a full-blow contemporary stance. The use of CCM is turning IFB churches into contemporary churches everywhere (as it did with Highland Park Baptist Church, home of my alma mater, Tennessee Temple). Contemporary worship is ALWAYS in the midst of those great changes, as we have documented in the free eBook The Collapse of Separatism among Fundamental Baptists. That is because CCM is not just music written by people who hold some questionable doctrines; it represents an end-time movement that is diametrically opposed to an “old-fashioned” Bible stance, a movement that is an enemy of what an “old-fashioned” Baptist church stands for. The CCM crowd hates biblical separatism, and this is true for even the most conservative among them. Consider the very popular contemporary hymn writers, Keith and Kristyn Getty. Their songs are used used widely among “traditional, non-contemporary” churches, because they are considered relatively safe. At least eight of their songs are included in Majesty Music’s Rejoice Hymns. 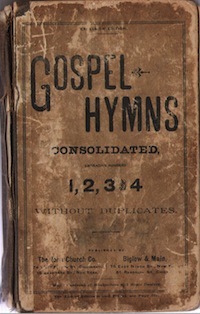 Twenty-nine of their songs are featured in Hymns Modern and Ancient, published by Heart Publications, a ministry of Steve Pettit Evangelistic Association and compiled by Fred Coleman who heads up Bob Jones University’s Department of Church Music. Both Crown Baptist College and West Coast Baptist College, the two largest independent Baptist Bible colleges, perform Getty material in their services. Yet the Getty’s one-world-church goal is to “bring everyone together musically” (www.keithgetty.com). In July 2012 the Gettys and their close friend Stuart Townend joined Roman Catholic Matt Maher on NewsongCafe on WorshipTogether.com. They played and discussed “The Power of the Cross,” which was co-written by Getty/Townend. The program promoted ecumenical unity with Maher/Townend/Getty entirely one in spirit through the music. “No one should deny the power of music to proselytize! Pastors in particular must defend their flocks from false teaching, heresies and ‘ear ticklers’ who bring worldly sensuality into the congregation; you are right to point out how easily this comes into a church through worship music. It seems wiser to decline the use of what seems to be a perfectly good song, rather than to give any honor and hint of endorsement to the composer and his/her mission” (e-mail, May 24, 2009). Third, the old Protestants believed in the same God and the same Christ as fundamental Baptists, but the Contemporary Christian Music world is filled with false christs and false gods. Whatever doctrinal differences a Baptist would have with Martin Luther or John Wesley or Fanny Crosby or KJV translators such as John Rainolds, we share the same Christ and the same God, but that is often not true for Contemporary Christian Worship. The world of contemporary worship is a terribly dangerous world filled with gross heresies and false christs, and those who play with this music build bridges to this world. There is the non-Trinitarian god of Jesus Only Pentecostals such as Geron Davis, Joel Hemphill, Mark Carouthers, Phillips, Craig and Dean, and Lanny Wolfe. There is the non-judgmental male/female god of The Shack. There is the rock & roll party-dude christ and the rebel christ of Christian rockers such as P.O.D. There is the Rob Bell god who would not send people to hell. All of these and more are popular among Contemporary Christian artists. Fourth, in the age in which live we must be doubly cautious about using hymns of dubious doctrine and association. In the Internet age, people are only a Google search and a mouse-click away from associating with authors and song writers. By promoting the contemporary hymns of the Getty’s, for example, West Coast Baptist College and Majesty Music and Bob Jones University and Northland University and others are encouraging people to join hands with the Gettys. Many of those who learn about the Getty’s music from these sources will doubtless find them on the Web and be influenced by their rock & roll “music is neutral” philosophy and their ecumenical stance and dangerous associations. Preachers who claim to believe in biblical separation and end-time apostasy and who claim that they want to keep their churches in the “fundamentalist” philosophy and orb, but who are playing with CCM, are playing with fire; and their people, especially the next generation, are going to be burned. These preachers can huff and puff at me all they want, and they can try to make me the issue in this battle, but it doesn’t change the fact that they are playing with fire. It doesn’t change the dangerous character of contemporary worship music. Time will tell, but it will be too late for those who don’t wake up and draw clear lines of separation from contemporary worship today. For documentation of the great spiritual danger represented by contemporary worship musicians that are being used by Bible-believing churches and the fact that this music is a bridge to the one-world church, see the following free materials at www.wayoflife.org.